JNN 11 Aug 2014 Manama : Protesters in the tiny Persian Gulf country of Bahrain have staged an anti-regime rally in protests against the ruling Al Khalifa dynasty’s continued suppression of dissent and its violation of human rights. Plus its Policy of Revoking Nationalities of Shia Citizens , and awarding Nationality on Sectarian Grounds on Large Scale to change the Demographic of the Island Nation . On Saturday, demonstrators in the island of Sitra, situated 12 kilometers (7 miles) southeast of the capital, Manama, expressed their outrage over the recent measures adopted by the Bahraini regime to grant citizenship to foreign nationals. They said by such tactics, Manama is trying to tighten its grip over the nation. According to opposition sources, the number of foreign nationals who have gained Bahraini citizenship has increased recently. Last week, a court in Bahrain deprived 13 Bahrainis of their nationality over charges of involvement in “terrorist” operations. The main opposition party in Bahrain, the al-Wefaq National Islamic Society, says prisoners at a Bahraini jail are suffering from “mistreatment” and their basic humanitarian needs are being ignored. In a statement released on August 5, the al-Wefaq human rights department voiced “grave concern” about the conditions of the Bahraini activists locked up in the Jau prison. 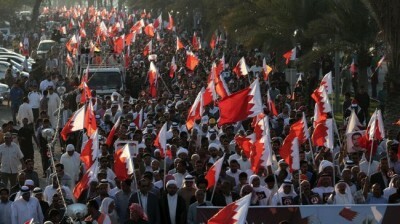 Since mid-February 2011, thousands of anti-regime protesters have staged numerous demonstrations in the streets of Bahrain, calling for the Al Khalifa royal family to relinquish power. On March 14, 2011, troops from Saudi Arabia and the United Arab Emirates were deployed to the country to assist the Bahraini government in its crackdown on the peaceful protesters. This entry was posted in Middle East and tagged Al Khalifa, Al Khalifa Regime, Bahrain, Bahrain Shia Population, bahraini government, Demographics, Human rights, human rights violations, Manama. Bookmark the permalink.